Heat gas or charcoal grill. Cut 4 (18x12-inch) sheets of heavy-duty foil; spray with cooking spray. In small bowl, mix barbecue sauce, honey and cumin. 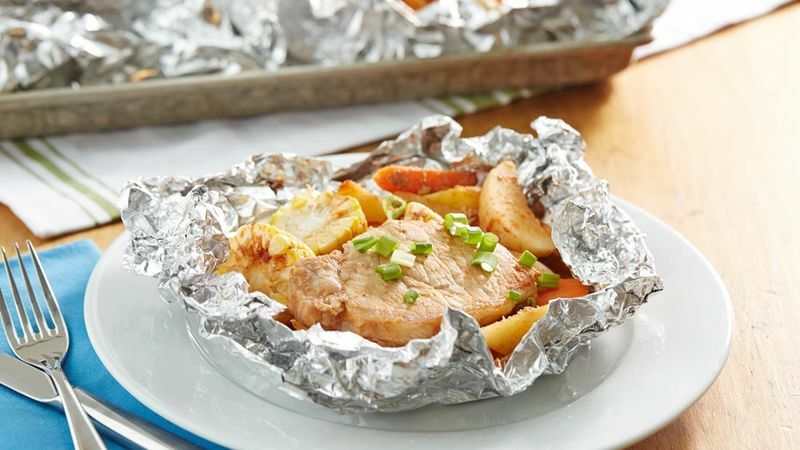 Place 1 pork chop, 3 pieces corn, 1/4 cup carrots and 1/2 cup potato wedges on centre of each foil sheet. Spoon 3 tablespoons sauce mixture over pork and vegetables on each sheet. Place packets on grill. Cover grill; cook over medium-low heat 15 to 20 minutes, rotating packets 1/2 turn after 10 minutes, until pork is no longer pink and meat thermometre inserted in centre reads 160°F. To serve, cut large X across top of each packet; carefully fold back foil to allow steam to escape.